From left, Martinrea Executive Chairman Rob Wildeboer; Flavio Volpe, president of the Automotive Parts Manufacturers' Association in Canada; McLarty Associates Chairman Thomas "Mack" McLarty; Óscar Albin, president of the National Auto Parts Manufacturing Association in Mexico; and Automotive News Publisher Jason Stein. DETROIT -- Cautious optimism about the future of the North American Free Trade Agreement is beginning to replace the gloom and doom of recent months among auto industry leaders. 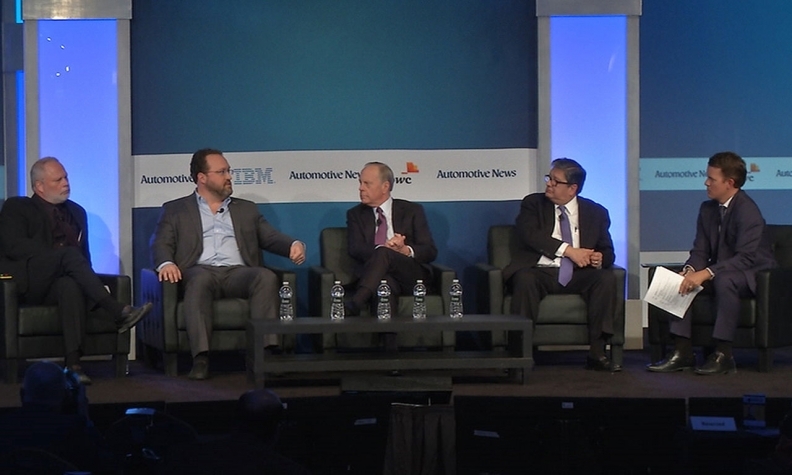 Panelists at the Automotive News World Congress here put the odds of successful renegotiations between the U.S., Canada and Mexico at better than even now that President Donald Trump can show voters enough concrete successes on the economic front to pull back from his threat to scotch the deal. "I think with passage of the tax reform package, some of pressure is off the White House," said Flavio Volpe, president of the Automotive Parts Manufacturers' Association in Canada. Trump "has got some good news. He doesn't need to use NAFTA to punish" a trading partner to demonstrate that he's helping middle-class workers and creating jobs. Trump has championed the cause of displaced manufacturing workers in the heartland and decried trade deals such as NAFTA for making it easy for companies to outsource production to low-cost countries such as Mexico. Fiat Chrysler Automobiles' announcement last week that it is moving Ram production from Mexico to Michigan and the decision by Toyota and Mazda to invest $1 billion in a joint Alabama assembly plant give the administration two victories to claim for U.S.-based manufacturing. Some U.S. businesses, including FCA US, are also paying employees bonuses that they say are attributable to savings from the US$1.5 trillion tax cut law Trump signed last month. "If his surrogates can find a way to stitch those stories together, they can find a way to back off the boiler on NAFTA, and say we're getting the action we want" on reshoring manufacturing, Volpe said. The chances for negotiating success are now 90 per cent, he said. He added that the talks have been aided by quiet meetings among professional trade negotiators without the presence of political leaders over the past month. Last week, Trump also signaled that he might be flexible on his threat to walk away from NAFTA and be willing to resume negotiations after Mexico's upcoming presidential election. Volpe suggested that would open the door to postpone talks until after the U.S. midterm congressional elections in November. Óscar Albin, president of the National Auto Parts Manufacturing Association in Mexico, said there is only a 25 per cent chance that NAFTA talks will fall apart, despite hard-line positions put forward by the U.S. on rules of origin and other issues. He reached that conclusion, he said, after meeting last week with Mexico's minister of economy, Ildefonso Guajardo Villarreal. "I think we're going to muddle through. I give it a 60 per cent chance that we'll have a modified, improved NAFTA," Rob Wildeboer, executive chairman, Martinrea International, told the audience.